Apples are a favorite fruit of many people around the world. Because of locations, origins or grafting, many variations of apple trees have developed over time. Apple trees can be found in both private orchards and in the wild. If you know what to look for, you can easily identify an apple tree, and the type of apple growing upon it. There are a few specific guidelines that will help in finding out if the tree in question is an apple tree, and if so, what kind you have found. Pick the best location where apple trees might be found. A good location would be in an area where there is full sun, good drainage and lots of room. Apple trees prefer open sunny locations higher up rather than shaded or crowded valleys. Look at the leaves and blossoms. Apple trees have coarse, oval leaves and they don't change color in the autumn. During growing season, the 1-inch-wide blossoms will have five petals colored pink and white. Identify an apple tree by the fruit. The apple will identify the type of apple tree, but take along a catalog of apples for picture reference. Apples can also be seen at different times of the season, depending on the variety. Large, smooth apples with a pink color on one side and green on the other are pink ladies. Smooth glossy green apples are granny smith. Fuji apples are a dry pink and green stripe. Determine the apple tree by region. Arkansas black apples only grow in Arkansas; while Baldwin apples are seen in New England. Crab apples only grow in the northern hemisphere. 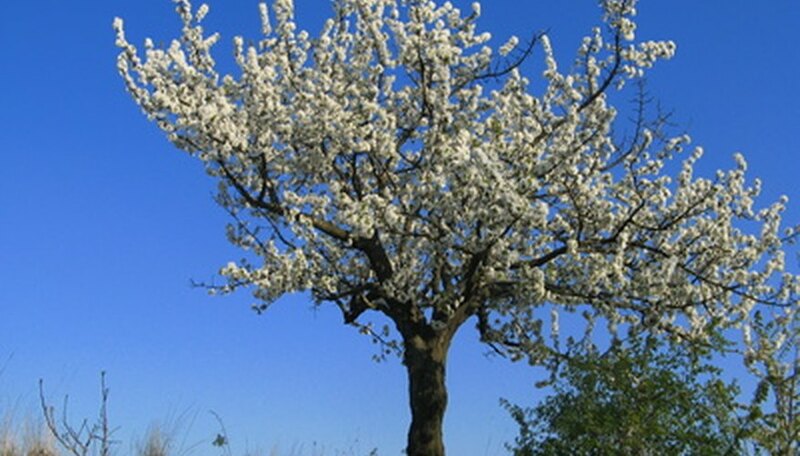 Watch for variant trees that don't follow normal apple tree patterns. These would include dwarf apples and crab apples. Dwarf apples are found on trees that resemble apple trees, but only reach 10 feet in height; the apples are much smaller. Crab apples are smaller still, resembling green or yellow cherries.